Every summer I keep track of the out-of-state license plates I see in our county. About every other year I’ll find a Hawaii. Rhode Island and North Dakota are the rarest, but one of my favorites is the Utah plate with the red rock arch. 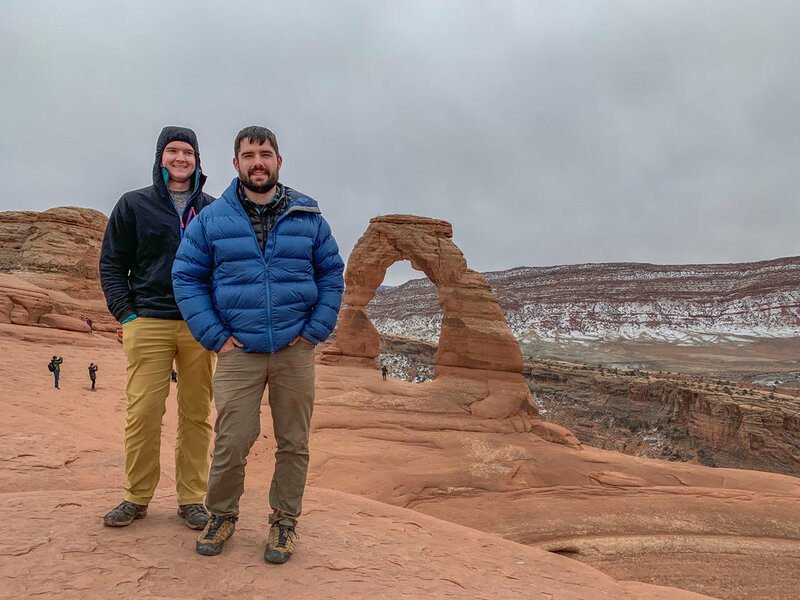 Today we — Joe, Josh, Jonah and I — hiked to the iconic spot represented on the Utah plate, Delicate Arch in Arches National Park. 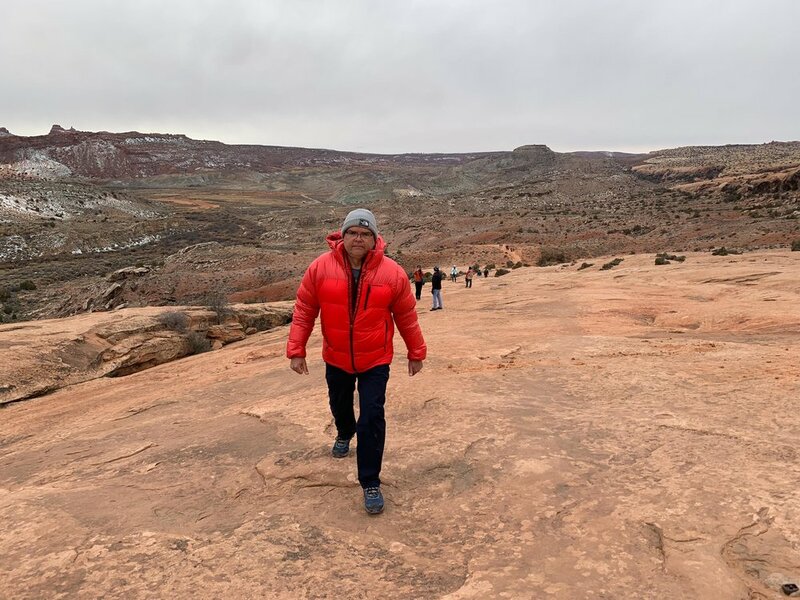 The state of Utah stepped in during the federal government shut-down and funded the park’s Visitor Center through the holidays, but we didn’t see any rangers on the trail. Hiking in National Parks sometimes feels like a pilgrimage. While trekking along you hear a myriad of languages. Everyone is going to the same spot but not everyone is prepared. Walking is a part of my daily routine. I love to see where my feet can take me. So I’m always surprised when we see people who look like out of place in the out-of-doors – almost as if they’re traveling in a foreign country. As we started today’s hike we saw parent’s enticing young children with snacks. I’m familiar with that technique. Years ago, I carried packets of fruit snacks in my pocket. Now, my sons wait for me to catch up. At the half-way point, we noticed two young ladies wrapped in blankets that looked exhausted but determined. One had bright green hair, the other Big Bird yellow. The final approach was along a ledge. At the end, the arch is visible and spectacular, but not the expected red, more of a washed-out orange. Perhaps the arch is redder in the morning light? Jonah and I waited in an informal line to stand underneath the arch for a photo op. A kind stranger took our picture. The view without a line worked for Joe and Josh. They opted to wait outside the photo zone. On our return trip we passed the dyed-haired ladies, still trudging along. I shouted out an encouraging, “You’re almost there. Just five more minutes.” We made it back to the car just before sunset. A handful of visitors were just starting the three-mile trek. The mother in me wanted to point out the setting sun as they hurried along. Joe told me not to worry, they could use their cell phones as flashlights.